Fronted by Lullaby for the Working Class' Ted Stevens, along with remaining Lullaby members Mike and A.J. 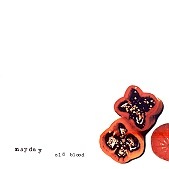 Mogis, Mayday's Old Blood delivers strong songwriting and undeniable emotion. Nine folk-inspired, indie-pop nuggets, carved out as Stevens' reveals himself though the songs, the light whisper of the songs, hushed melodies, and suppressed rock moments make this a sleepy, pleasant trip down confessional street, as Mayday wears it all on their sleeves. I'll give this a B+.